Problem gambling is a significant mental health problem that creates a multitude of intrapersonal, interpersonal, and social difficulties. Recent empirical evidence suggests that personality disorders, and in particular borderline personality disorder (BPD), are commonly co-morbid with problem gambling. Despite this finding there has been very little research examining overlapping factors between these two disorders. The aim of this review is to summarise the literature exploring the relationship between problem gambling and personality disorders. The co-morbidity of personality disorders, particularly BPD, is reviewed and the characteristics of problem gamblers with co-morbid personality disorders are explored. An etiological model from the more advanced BPD literature—the biosocial developmental model of BPD—is used to review the similarities between problem gambling and BPD across four domains: early parent–child interactions, emotion regulation, co-morbid psychopathology and negative outcomes. It was concluded that personality disorders, in particular BPD are commonly co-morbid among problem gamblers and the presence of a personality disorder complicates the clinical picture. Furthermore BPD and problem gambling share similarities across the biosocial developmental model of BPD. Therefore clinicians working with problem gamblers should incorporate routine screening for personality disorders and pay careful attention to the therapeutic alliance, client motivations and therapeutic boundaries. Furthermore adjustments to therapy structure, goals and outcomes may be required. Directions for future research include further research into the applicability of the biosocial developmental model of BPD to problem gambling. Cowlishaw, S., Merkouris, S., Dowling, N., Anderson, C., Jackson, A., & Thomas, S. (2012). Psychological therapies for pathological and problem gambling. Cochrane Database of Systematic Reviews. doi: 10.1002/14651858.CD008937.pub2. Dowling, N. A., Cowlishaw, S., Jackson, A. C., Merkouris, S. S., Francis, K. L., & Christensen, D. R. (2014a). The prevalence of comorbid personality disorders in treatment-seeking problem gamblers: A systematic review and meta-analysis. Journal of Personality Disorders. doi: 10.1521/pedi_2014_28_168. Francis, K. L., Dowling, N. A., Jackson, A. C., Christensen, D. C., & Wardle, H. (2014). 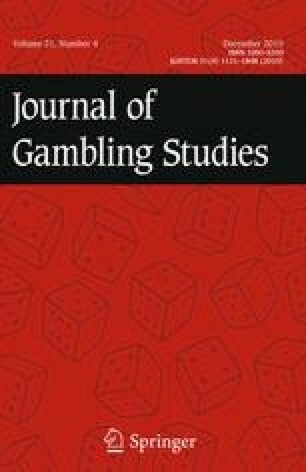 Gambling motives: Validation of the Reasons for Gambling Questionnaire in an Australian population survey. Journal of Gambling Studies. doi: 10.1007/s10899-014-9458-1.